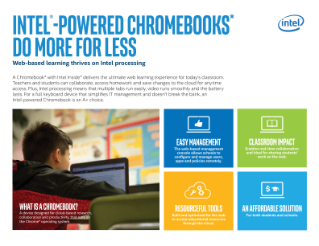 A Chromebook* with Intel Inside® delivers the ultimate web learning experience for today’s classroom. Teachers and students can collaborate, access homework and save changes to the cloud for anytime access. Plus, Intel processing means that multiple tabs run easily, video runs smoothly and the battery lasts. Reinvigorate your customer's compute experience with new PCs.